Now that you've learned all about what it takes to start the detox and how I felt after round 1, I'm back to share with you tips from my second time doing the Dr. Oz 3-day detox. Let me start by saying that I am definitely still a fan of this program. I once again lost 5 lbs and feel like my tummy "pooch" is much smaller. In fact, I started the detox this month smack dab in the middle of my "monthly visitor". My husband was scared it was going to magnify my grouchiness (I don't know what he's talking about, I'm never grouchy), but I think it actually had a positive effect on my mood because I didn't feel so bloated. While this detox is intense for someone who loves her bread and sweets (me), I was surprised yet again by my eagerness to dive in and drink my meals for 3 days straight. On day 4, you would think I would have wanted to start my day with a stack of starch like pancakes or french toast, but I found the opposite was true. I wanted to eat light - I made some scrambled eggs with Egg Beaters and 2 pieces of turkey bacon. I almost made my breakfast smoothie instead! So, more than ever, I am a believer that using this to kick-start healthy eating habits is a major bonus of completing this program. 1} Enlist a friend to do it with you - When I told my neighbor about it, she wanted to join me this time and it turned out to be such a good thing for many reasons. Not only did it give us each someone to share our experience with and keep us on track (misery loves company, right? ), we were also able to share the cost. I already had leftover items that came in large packages like the coconut oil, flax seed, etc. So I packed up whatever I had enough of in small Tupperware containers and sent it on down to her with a list of what else she would need to buy on her own. I was out of a few things too, so when she grabbed her stuff from the store, she picked up extra bananas, almond milk and coconut water for me. 2} Choose your 3 days wisely - If you try to start on your son's birthday when you will be tempted with pizza, cake and ice cream, you are setting yourself up for failure. That is why although I originally planned to do the cleanse Sunday-Tuesday, I realized I should give myself a free pass for Sunday (my son turned 6) and start Monday instead. Take out your calendar, look at what you have coming up and consider your schedule when choosing when to begin. My neighbor had plans to have dinner with friends on Wednesday evening, so she chose to go ahead and start Sunday to accommodate her schedule. 3} Plan for curveballs and DON'T cave - Even if your calender seems open enough, there are always things that could pop up and cause a potential problem. I had a business meeting rescheduled for when I was on day 2 and we planned to meet at a restaurant. While the thought crossed my mind to "cheat" for just one meal, I made my shake ahead of time and brought it with me instead. In addition, my son had an early release day from school on day 3 and I decided to take the boys to an indoor playscape to let them burn some energy. As I sat there smelling the homemade waffle cones and watching others eat burgers and fries I cursed my green lunch shake with every sip, but I drank it. I did not cave. -- Green Tea/Lemon - I am a fan of green tea and drink hot tea regularly anyway, but something about adding the slice of lemon made it almost impossible for me to finish the whole mug. By day 2, I omitted the lemon. -- Lemon - I wasn't sure whether to use the lemon rind, just the pulp or just the juice. The first time around I used lemon juice because I thought it'd be too difficult to do it any other way. This time I sliced the lemon, then sliced off the rind and used the pulp (but removed any seeds). I think it made it taste better this way. Not quite as acidic. -- Celery - The recipe calls for 4 stalks. I used 3. And I was sure to chop it up pretty good which helped it blend better, making it less stringy. -- Kale/Spinach - I picked the "stem" off each leaf. I read somewhere that this helped with the texture. Also, I ran out of kale on day 3 so I substituted spinach in the lunch and dinner drinks. It had little effect on the taste, but I actually think I liked it better with the kale. -- Apple and Cucumbers - Again, not sure if these were supposed to be used with the skin on, but I ended up peeling the cucumber and cutting the skin off the apple pieces. -- Cayenne Pepper - I played around with the amount used from day to day. 1/4 tsp was definitely too much. 1/8 tsp was a little less than I would have liked so I kind of eyeballed it on day 3 and it was good. But be careful, a little makes a BIG difference. 5} Use the freezer - I kept most of the fruit in the freezer and found that it made the drinks much more enjoyable if they were ice cold. The first time around I didn't do this and added ice to the mix, but it turned watery really quick and then they didn't taste so good. And just an FYI - the flax seed should be kept in the fridge. I didn't notice that on the bag until this time. Oops! 6} Use a good blender - I cannot emphasize this enough. And by good, I don't necessarily mean super expensive. As I mentioned before, I bought the Oster My Blend for $30 at HEB and it has been amazing. I tried to prepare the shakes in the more expensive (albeit older) blender that we got for our wedding and it definitely left the drinks chunky. Yuck. My neighbor said she had to use her food processor at some points to make it really smooth. 7} Make it easy on yourself...rinse or clean your drink container as soon as you are finished - There were a few times it worked out that I could clean my container in the dishwasher, but if I wasn't ready to run a load I learned quickly that just tossing it into the sink was a big mistake. The first time I did that after the lunch drink, I spent 15 minutes cleaning the stuck-on coconut oil and flax seed from the container so I could use it at dinner time. If you don't have time to clean it completely, at least fill it to the brim with soapy water. You'll save yourself time and frustration later. 8} Take advantage of the baths - Aaahhh, this was the best part of the day. I only did the detox bath once during the first time. I usually just wanted to get in bed instead of soak in the tub. But this time I made the extra effort to soak and it really made a difference. The detoxifying properties of the epsom salt and the soothing scent of lavender made me feel like I was at an expensive spa. HOWEVER - I will warn you that on day 3, my extended soak left me feeling extremely thirsty and a little weak. Perhaps I stayed in the bath too long or hadn't had enough water to drink. Either way, I urge you to proceed with caution. 10} Give yourself a huge pat on the back at the end - Go get a manicure. Treat yourself to a frozen yogurt. Brag about your success to your friends. For me, doing the detox once was so satisfying. Doing it twice made me feel like a health rock star. While I have many more nutrition habits that I need to change to truly be a health-nut, successfully completing a 3-day detox is something I never thought I could do. So celebrate! Just don't indulge in a bunch of junk or you'll be back at square one! Don't forget to read my initial review from my first time doing the detox HERE. If you found this article helpful, feel free to hit the share buttons below, pin this to Pinterest or "like" More Skees Please on Facebook for even more updates that aren't here on the blog! I have not been as gung ho as you were to do this detox a second time but I will say I thought it was pretty easy the first time around and also decided on some tweaks I would make if I were to do it again. I would definitely not use the coconut oil as I thought this was was too waxy for my taste and it never blended right. Any suggestions? I like coconut so I want to keep it in there if possible. I decided after the detox I would drink the green tea every morning without the lemon. I too found that everything was very acidic when I just used the juice (as you did too), so much so that my throat was burned after the first day by all the acid I was drinking. I also decided to try to do my favorite drink for a meal to continue the weight loss but that hasn't stuck yet. Once my favorite fruit, strawberry, is back in season I plan to try the breakfast drink in the evening with strawberry instead of raspberry. I felt exactly like you did when coming off the detox. I was actually afraid to eat solids the next couple days in any portion because I was just not that into eating a lot and I didn't have any cravings so not eating didn't sound that bad. Mind you, I still weaned my way back to solids starting day 4 but the desire was totally killed to eat sweets and junk as it had been before the detox. Again, thank you for sharing this as I would never have heard about the detox otherwise. I really enjoyed it and will definitely do it again. I'm glad to hear someone else did it and liked it as much as I did! As for the coconut oil, try putting it closest to the blade (for me it would go in last as I flipped my drink container over to blend - but if you are using a regular blender, try putting it in first). I found that sometimes playing around with the order in which I put the ingredients in helped with blending things up better. I enjoyed the coconut oil though so I'm not sure if that'll do it for you but you might try! Hey Taryn ! How are ya? Its Melanie Kleier well now Vickers lol. I try to be as healthy as possible, however I am like most people I have my down falls in some foods. I have been eying detox diets for a long time, but felt most of the "ten" day were too long and scary for me!! 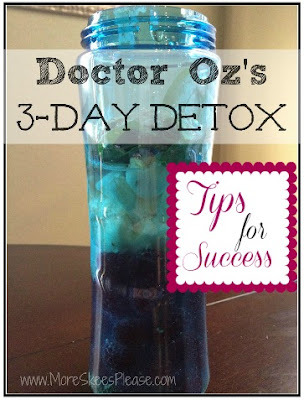 I loved your post about the 3 day detox! My husband works in Africa four weeks at a time, so after I dropped him at the airport I went to Whole Foods and got the stuff for your Detox! The only worries I have is I do Hot yoga daily, did you work out during these three days? Also I bought mostly fresh fruit did you throw them all in the freezer?? Any tips? Hope your doing well!!! Thanks!! GMCWAmberly- I haven't done this cleanse (yet!) so I am certainly no expert but in reading others reviews and tips they say melting the coconut oil prior to adding it to the smoothie will help with the texture. @Melanie - let me know how it goes! And yes, I did throw most of the fruit in the freezer. Someone mentioned just buying frozen fruit but I don't do that because I like the fresh stuff, just frozen once I get home. I find that the frozen raspberries and blueberries that come in the bag from the grocery end up really watery and messy. Only fruit I keep out is the bananas (only because my kids go through them like crazy) and of course the apple and pineapple. Hi, I came across you blog when I decided to try this detox cleanse and wanted to see what others were saying about it. I'm on day one and a failure already (sort of). I could not even get down a 1/2 cup of the Lunch drink and these drinks are large. I resorted to eating the other half of apple, part of the cumcumber I didn't put in the drink and a stalk of celery. This lunch drink was, for lack of a better word, to "grassy" for me. I've never made fruit / veggie smoothies before so this could be why so far I'm not a fan. I'll try the dinner drink later but if it's as terrible as the lunch it will be a 1 day detox cleanse for me. Congrats to you on getting through it twice! Can you make the drinks ahead of time. If so do you freeze them or just keep in refrigerator? I want to take my to work with me. Hi Patsy - Great questions! I would think that getting healthy and "detoxing" your system would be okay for someone of any age. Please remember though, I am not a doctor and if you have specific concerns, you should always discuss them with a medical professional before starting any kind of diet. As for "commode hugging" (hehe, that made me laugh), I only found that I had to urinate more often than usual...not anything else. Towards the end of the detox I did spend a few extra minutes in the bathroom with a pretty distinct result that appeared much darker than usual(sorry, too much information). After the cleanse, I would try to avoid processed foods in general and continue to consume fruits and veggies at every meal. I also found it helpful to continue to substitute one meal with one of the detox shakes (ie. shake for breakfast, regular lunch and dinner). I have done this particular detox 3 times in the last 5 months. I would think 1/month would be safe. Again, check with your doctor for advice. I am on Day 2 now and find that I like this a lot. I am not getting hungry until it's really time for the next liquid meal. You can do anything for 3 days and I'm eager to see how I feel on the third day and if I've lost any weight. I'm doing this to get control back over my eating habits and jumpstart more of an extended weight loss program. I am 16-20 pounds overweight after a year or so of latenight stress-eating and breaking my foot and ankle last year. I packed on so much around my waist and hips that I can't wear half of the clothes I have. I am ready for a change and hope this is the impetus for positive change for me. I just started the cleanse yesterday and was really excited about it! My breakfast drink was great and I was ready to take on the day. I went and did Pilates for an hour before coming home for lunch. The lunch drink wasn't as bad as I expected but it was difficult to finish. By the time I got to the dinner shake I felt stuffed and completely exhausted. It took forever to wake up this morning, but the breakfast shake is stil good. I'm waiting to see how I hold up the rest of today and tomorrow. I hope I can make it, I'd hate to see all that money go to waste!